…and some things not so funny, and some things kind of sweet, and some things I’m still trying to figure out. 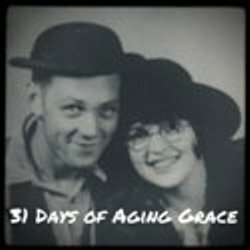 Please join me October 1st as I post each day of the month about Aging Grace… a state of being… not a woman. My apologies to any ladies named Grace. I’m connecting with a community of bloggers who will spend the next 31 days writing about just one thing. I’ll post links to all the 31 Days posts right here…. Day Twenty-three ~Why Can’t Things Stay The Way They Were? Day Twenty-seven ~Are We There Yet? Excited – looking forward to reading your posts, your perspective, your lessons. See you there! Me too 🙂 It will be a treat to see your story unfold each day. Sounds like fun for all of you! …You had me at Aging Grace!!! Is it like Nanorimo for Bloggers!?!?! Can hardly wait to see your embracement of this term!! !